University Dining: Go Yogurt and Take the Gelatin With You! Go Yogurt and Take the Gelatin With You! Back in the fall semester of 2009, we began getting requests for vegetarian yogurt which basically means not using gelatin as a binder. I figured, no problem, I will call my yogurt supplier and add it right away. My adventure in yogurt starts there. Other brands such as Dannon and Stonyfield have already taken the initiative, but Yoplait has yet to accommodate the vegetarians. I don’t typically like to “call out” a particular company in which we do a lot of business with, but it seems Yoplait has simply missed the proverbial boat on this one and indifferently made me learn more about yogurt than I ever wanted to. OK, it was a little interesting. I also intend this to be the last time I ever want to talk about yogurt unless there is some relationship discovered between yogurt and quantum physics that might prove to be beneficial to humankind… In a minor deviation from our Yoplait agreement, we started to bring in the Dannon variety of vegetarian yogurt which uses either pectin or carob bean extract as a binder instead of gelatin. To make sure we had this product for vegetarians, we kept it under guard in the kitchen and made it “upon request only.” That was November of 2009 and figured I could sleep again having solved the mystery of binding ingredients in yogurt. After the Winter break, to my great surprise, I was talking about yogurt again because my supplier stopped carrying the Dannon variety of vegetarian yogurt while we were hibernating. The calls came in from the vegetarians and managers that we were not getting the yogurt again. 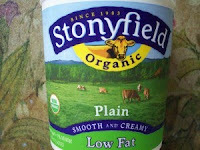 Anyway, a few calls to our supplier and we sourced the Stonyfield brand and that is where we stand today. I have tasted all the brands of yogurt at this point and simply cannot taste the difference between gelatin, pectin, or carob bean varieties of yogurt. I am pleading with the industry to drop the gelatin altogether. Not only will you be accommodating the growing number of vegetarians, but keeping me focused on more visionary aspects of University Dining like the growing obesity rates, wellness, and nutrition.